Here is a new figure set from Master Box. 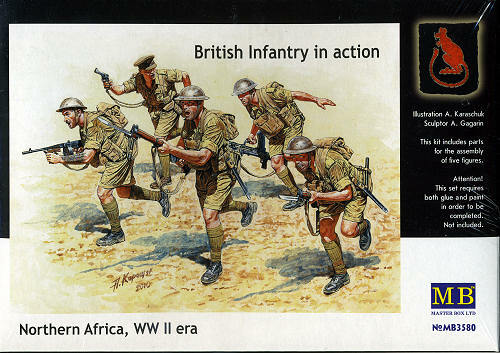 This one has five figures dressed as British infantry with the 8th Army in the North African deserts. Of course, they could also be used for a Sicily diorama. Needless to say, these are all in shorts and tall socks and charging forward, being urged onward by an officer brandishing a pistol attached his belt by a lanyard. These men are not encumbered by a lot of accessories so that will ease in building. Typical of these kits, the instructions are on the back of the box along with painting information using Vallejo colors. Master Box figures are well molded and assemble relatively quickly. They are just the thing for a WWII desert warfare diorama.